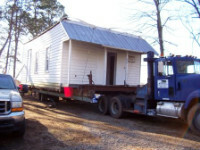 Take a look at our videos to see a cabin we moved in Greenback, TN. The cabin had to be moved back about a 150' because it was built to close to the property line. This house was going to be demolished if it was not moved within 17 days when we got the contract to move it we came in and got the house including the dog house moved with 3 days left before the house was demolished. Here is a picture of the 100 year old Wilders Chaple A.M.E. Zion Church that we moved from Maryville Tennessee, to the Great Smoky Mountains Heritage Center in Townsend Tennessee. This historic church will be a new exhibit at the Heritage Center. IASM seeks Nationwide Relocation vs Demolition Policy. The information below has been condensed from its original format for space purposes. Please contact us for a copy of the full brochure. All the information contained here is straight out of the International Association of Structural Movers' (IASM) brochure. They are undertaking a nationwide effort to encourage each of the 49 remaining states to enact a program patterned after the Iowa Solid Waste Alternative Program. According to the U.S. Environmental Protection Agency, construction and demolition (C&D) debris is a complex waste stream generated during building construction, renovation and demolition projects. While some local waste haulers have made an effort to remove valuable materials for recycling, most waste ends up in landfills. Such materials included concrete, steel, wood and shingles. In addition to these wastes, hazardous materials, such as asbestos, lead and mercury may also be generated. 1. GREEN HOUSE GAS: The United States Environmental Protection Agency has estimated that US companies generate 136 million tons of building related and construction demolition (C&D) waste per year. Of that total, 92 percent comes from renovation and demolition. That's enough to construct a wall 30 feet high and 30 feet thick around the entire coast of the continental United States. That's 4,993 miles! Thirty-three million tons of this debris ends up in landfills. As anaerobic microorganisms decompose the wood, it will release about five millions tons of carbon equivalent in the form of methane gas. This is equivalent to the yearly emissions of 3,736,000 passenger cars. 2. ENERGY: Every building represents a significant investment in energy. For example, energies consumed at each state of its creation; during the original extraction of raw materials, the manufacturing of the raw materials into usable building materials, transportation of the building materials to the site and by the equipment and tools used to assemble the materials into the final form of the building. The average house contains 892 million Btu's of embodied energy (the total expenditure of energy involved in the creation of the building and its constituent material), an amount of energy equal to 7,826 gallons of gasoline, or enough to drive an SUV 5 1/2 times around the earth. 3. ECONOMICS: The demolition of a typical 2,000-square-foot home can be expected to produce 127 tons of debris. While disposal fees can vary widely depending upon local conditions, at an average rate of $25 per ton disposal costs for a residential demolition would come to $3,175. Beyond this initial cost are the residual costs related to green house gases and landfill maintenance. 4. LAND USE: On a national level, the timber industry is the single largest user of our county's land. Timber production exceeds even agriculture in terms of sheer acreage. Reducing the consumption of new lumber reduces the amount of land needed by this industry to meet demand. Relocating a typical 2,000 square foot wood frame structure can yield 6,000 board feet of reusable lumber. This is equivalent to 33 mature trees, or the yearly output of 10 acres of planted pine (7 football fields). A MODEL PROGRAM: The Energy and Waste Management bureau of the Iowa Department of Natural resources has developed a model Solid Waste Alternatives Program (SWAP). Its mission to educate and assist Iowans to protect, conserve and enhance natural resources and the environment for all generations through the sustainable practices of pollution prevention,energy efficiency, and responsible waste management. RELOCATION BENEFITS ARE MANY AND VARIED: The benefits of relocating a structure are numerous and varied, according to Barb Budelier of Durant, Iowa. The procedure is better for the environment: trees are saved, landfill space is not used and the structure not burned, therefore not emitting harmful smoke into the atmosphere. WIN-WIN SCENARIO: Moving houses was a win-win scenario for Louisa/Muscatine counties following the floods of 1993 in Iowa. The Reggie Meyer Housing addition of 120 homes in the flood plan was flooded. After the water receded, FEMA decided to offer a voluntary by-out to the owners. More than 100 of the owners sold out. Louisa county was then contracted to oversee the demolition of the homes. Mare Patton, Executive Director of Muscatine's Center for Strategic Action in Iowa City, sought and received permission from the Board of Supervisors to sell and move the homes rather than demolish them. Over a two-year period, 98 of the homes were moved with the following economic benefits: a) Saved FEMA more than $450,000 in demolition and landfill fees, b) Preserved the tax base of rural school district and actually increased taxes due to the improvements on the moved homes, c) Stimulated borrowing of more than $4.8 million in home mortgages at local banks, d) Benefited an estimated 400 individuals with newly renovated homes. The International association of Structural Movers (IASM), in cooperation with the Iowas House MOvers Association, is seeking a national policy, both private and public, that would establish a "Consider Relocation First" prior to alternative methods of removal of structures. "It is the position of the structural moving industry that the same criteria and conditions that exits in the Solid Waste Alternatives Program (SWAP), developed by the Energy and Waste Management Bureau of the Iowas Department of Natural REsources, exist in all 50 United States," according to D. Michael Blake, President for IASM. N. Eugene Brymer, Staff Executive for IASM, has been coordinating with officials of the Iowas House Movers Association (IHMA) to enlarge the scope of research originated by IHMA Vice President Rick Goodwin, Goodwin House Moving, Inc,. Washington, Iowa, and a member of IASM, to encourage, IASM member in the other 49 states to bring to the attention of elected officials, executives of financial institutions businessmen in general and local housing authorities to factor "first" relocation benefits of structures."